Situated in the Northern part of Hampshire at Longparish, Near Andover, Vale Farm Fisheries is a set of three well-stocked commercial lakes, set in idyllic surroundings. 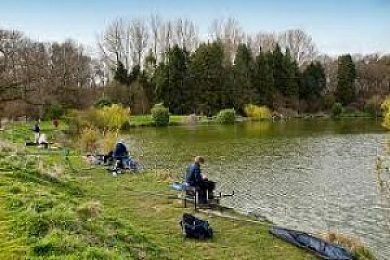 Located only five minutes from the A303, these beautifully kept lakes are run by people who are not only fish lovers, but clearly take pride in keeping the lake surroundings tidy and well manicured. The joy of these lakes, are that you can fish within twenty feet of another angler, and not know he’s there. The lakes are stocked with a good head of carp with plenty of doubles, including a Ghostie in the middle lake up to 29 lb. The middle lake has an island that many people tend to lay just off, when actually some of the bigger fish are swimming around the margins. The right hand lake is a bit more secluded but still has plenty of large doubles up to 23lb. This lake also has a good head of Tench and Bream as well a plethora of Rudd should you be looking to go for quantity rather than size. The left hand lake seems to be less fished than the other two but you can regularly see shoals of good sized common, cruising close to the surface. Vale Farm Fishery 8 out of 10 based on 1 ratings. 1 user reviews. Beautifully presented lake, very well maintained. Fished for the afternoon today, overcast with occasional light rain. Hooked and landed 4 mirror carp and 5 common. All u see 10lb, great days fishing in a stunning location. Bailiff came to visit twice, who by the way, is a very friendly man (unlike another I who visited at a different lake last week). All in worth every penny for a day ticket. I will definitely visit again very soon. surface fishing is starting to come alive here as of the heat.